One of the best tips I saw online about visiting Italy was that your trip should not be rushed. You should take the time just to observe the life going on around you. Of course, this advice was accompanied by a photo of a canal-side café table bearing a glass of wine and a plate of tapas. 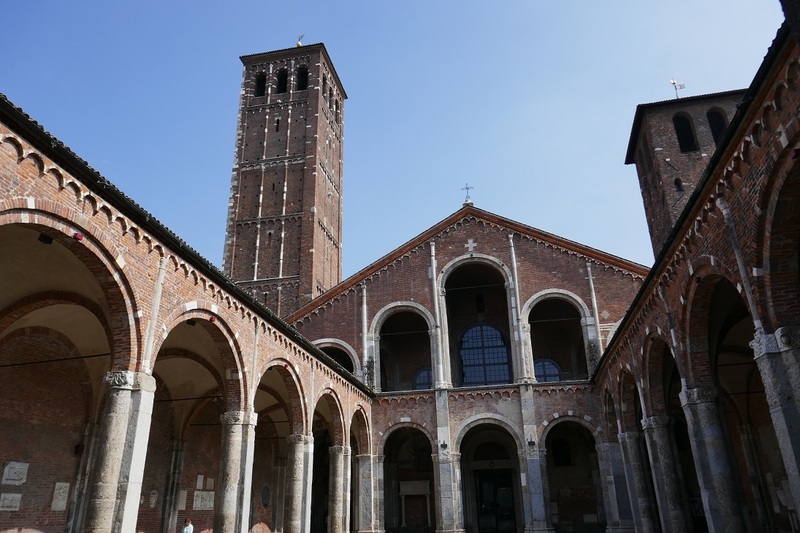 With that in mind, I took my Top 10 list (19, really) of what to see in Milan compiled from our two favorite travel websites, and pared that down to half its original size. Surely we could make it to nine sites in about 2 days time, right? 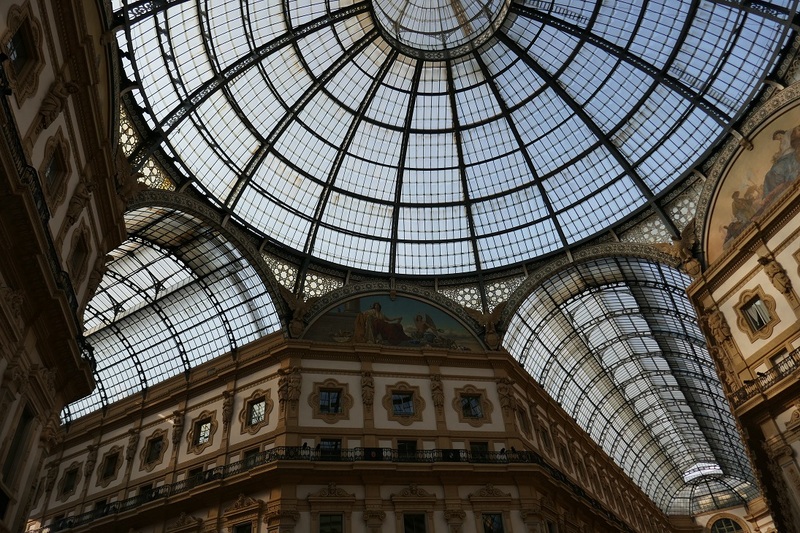 Considering that we were in one of the world’s fashion capitals and only about a 20-minute walk from a showcase of designer-everything, it made sense to head for Galleria Vittorio Emanuele II, a soaring iron and glass arcade built beginning in 1865 and at the time was Europe’s largest shopping arcade. Elegant and graceful were two words that came to mind as we strolled through the spacious arcade past cafés full of smartly dressed customers who had clearly been shopping in the adjacent exclusive stores. 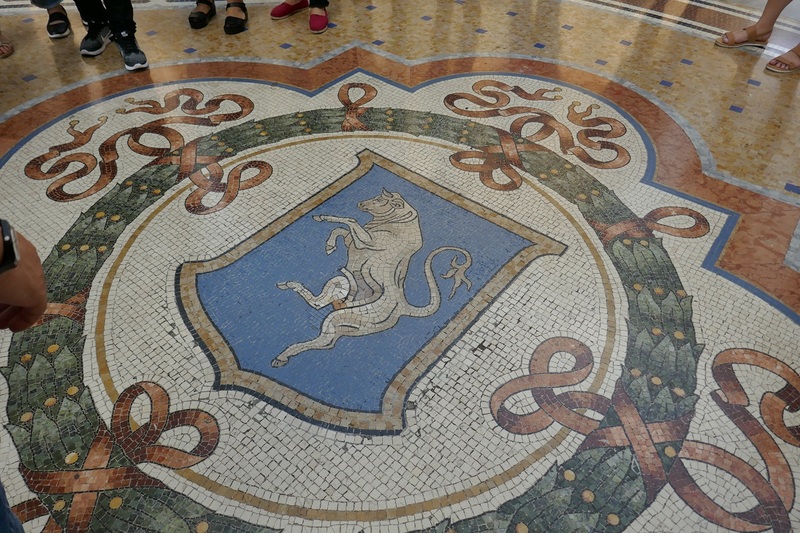 Even the floor has charm with huge inlaid mosaics portraying symbols of Italian cities including Turin’s bull. It’s thought that if you stand or even spin on the bull’s “below the belt region” you will have good luck which this poor creature certainly does not. After 150 years of over exposure to seekers of good fortune, now including Bill, he is a bit worse for the wear in that area of his anatomy. 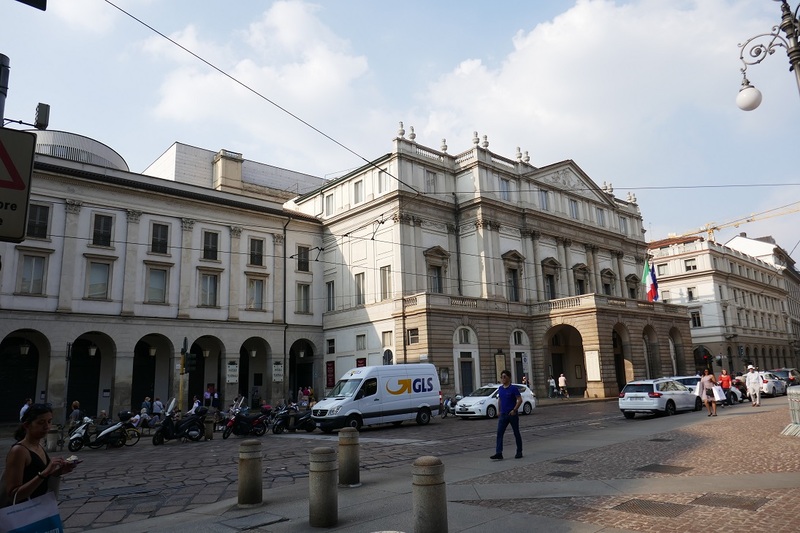 After admiring the bull we exited onto Piazza della Scala which is named for the opera house on its edge, La Scala. The exterior seemed rather modest in comparison to opera houses we’d seen in other cities but perhaps that’s not why you go there. The grandeur of the theater inside with 2800 seats had to match the performances of composers such as Verdi and Rossini. The attached museum houses a costume collection from some of those classics and also offers tickets for peeks inside the theater when it’s not otherwise in use. 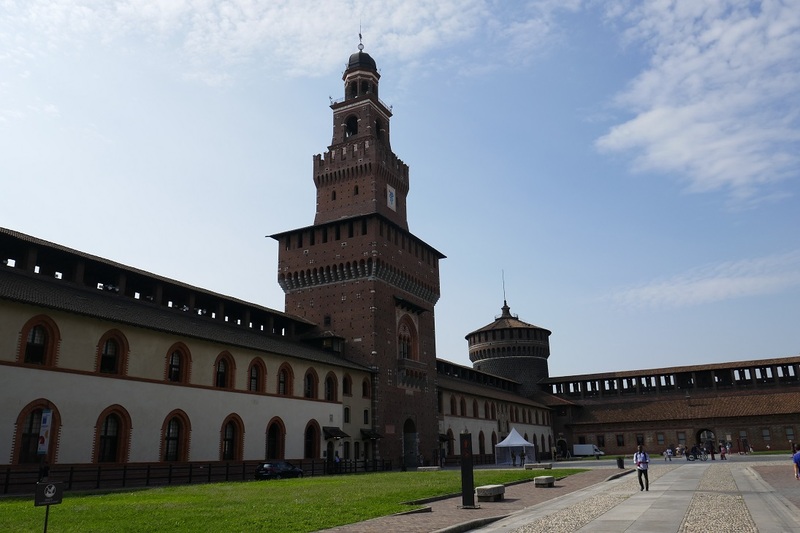 Built in 1368, the Castello Sforzesco served as the ruling families’ fortified home for almost 300 years. Today it’s a complex of museums covering Egyptian art, armory and tapestry, musical instruments, archaeology, furniture, and one room dedicated to the last sculpture that Michelangelo carved, the Rondanini Pietà. Although a ticket is required to go inside to view the artwork, it’s free to walk around the grounds of the castle. Hoping for a lakeside lunch, we wandered between two of the castle’s courtyards that lead directly into the dukes’ former private gardens, now public, called Parco Sempione. Although we found plenty of shady footpaths, bike trails, fountains, and viewpoints of the lake there were no restaurants directly beside the water so we exited the park for Bistro Posta. 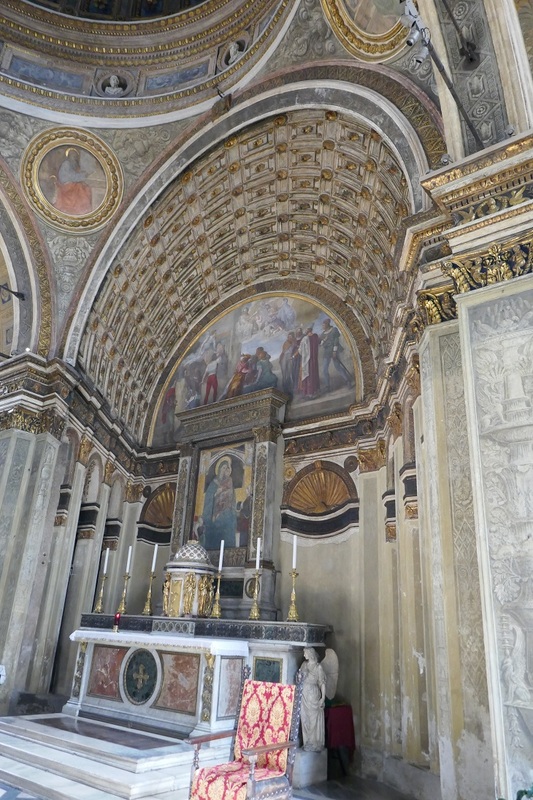 As with the opera house, the church exterior of Santa Maria Presso San Satiro appears to present a building of modest size until you step inside the ornate interior. Inside this 15th century church you are suddenly standing in a giant, vaulted room where the altar disappears far into the distance; except that it doesn’t. Thanks to the architect’s use of trompe l’oeil, a small space in the city was made big. 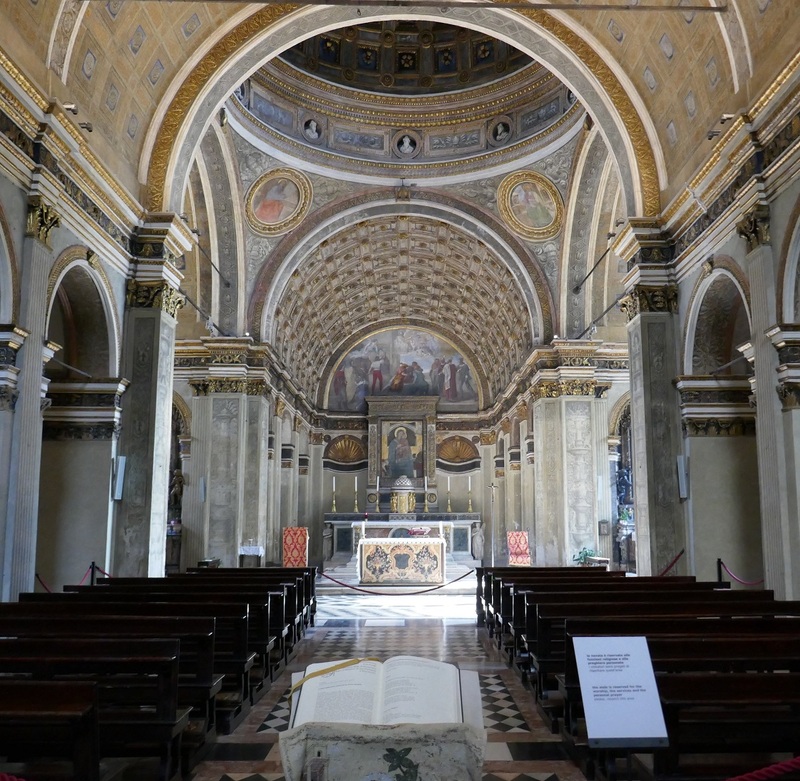 Milan’s patron saint is Ambrose who founded a church there in 386 although the building that now bears his name wasn’t constructed until the 1100s but a small chapel with a mosaic dome from the saint’s time period still stands next to the current church. 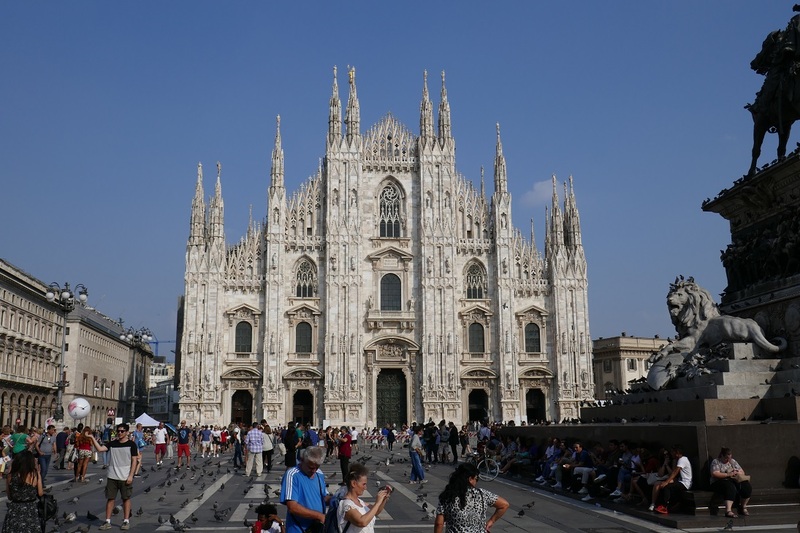 For genuine grandeur, our final stop was Il Duomo or the cathedral of Milan with space for 40,000 people. It was started in the 1300s but the facade was not finished until Napoleon’s order in the early 1800s. Over 2000 marble statues adorn the exterior walls while 135 carved spires decorate the roof. The world’s largest stained glass windows, dating from the 15th and 16th centuries, light up the interior. A red light bulb in the dome marks the storage spot for a nail that legend says came from the crucifixion of Jesus Christ. Once a year for the past 440 years the nail is put on public display along with a piece of wood said to be from the cross. Only one stop left on this tour of part of northern Italy and it’s in France: Annecy. That’s the next blog post. Posted on October 24, 2018, in Life in France, Travel in France & beyond and tagged Americans in Carcassonne, Public transportation. Bookmark the permalink. Comments Off on Milan in 2 days.